Online advertising has brought with it more benefits than traditional marketers could have anticipated. With online advertising and marketing you can reach more people at a global level, you can target your messages to be more relevant to your audience, you can interact with your community and collect their feedback in real-time, you will need a smaller budget and you can monitor results and make changes on the go. 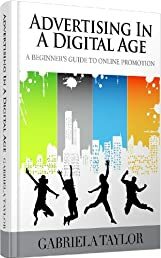 Throughout this book, I will cover some of the most common forms of online advertising and also provide tips on how to better improve your online advertising experience as a business owner or marketer. Gabriela Taylor is an internationally educated Global Online Marketing Strategist and Consultant who’s worked with some of the world’s biggest brands in Telecommunications, Retail, Lifestyle and Advertising. A recognized expert and specialist in Social Networking, Mobile Marketing and Search Engine Optimization she is fluent in 7 languages, has lived and worked in many countries throughout the world and has experience of implementing successful web-presence strategies for both startup and large established organizations. She is the founder of Global & Digital, a consultancy firm specializing in Online Marketing services and Cross-Cultural business practices and has also published several industry related books.